As early as 400 B.C. Hippocrates called the Elder his Medicine Chest. From the Middle Ages into the 19th Century, Europeans and American herbalists used the berry as a laxative and diuretic, to treat diabetes, and to increase resistance to illness and treat infections, such as flu. 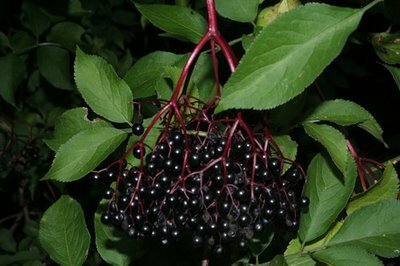 Beyond herbal medicine, elderberry has also been used for centuries to make preserves and wine. Used for Flu, Prevention of Degenerative Diseases, Heart Attack and Stroke and Gum Disease. A Druid Sacred Tree. Sacred to the White Lady and Midsummer Solstice. The Druids used it to both bless and curse. Magical Uses: Elder wands can be used to drive out evil spirits or thought forms. on panpipes or flutes made of elder have the same power of the wands. A Dryad “Elder Mother” is said to live in the tree; she will haunt anyone who cuts down her wood. Stand or sleep under an elder on Midsummer Eve to see the King of the Faeries and his retinue pass by. The flowers are used in wish-fulfillment spells. The leaves , flowers, and berries are strewn on a person, place or thing to bless it. Wood is NOT to be burned as it is sacred to Hecate. Flowers are used for altar offerings. Hung over doorways and windows, it keeps evil from the house. Carry Elder to preserve against the temptation to commit adultery. Add water and elderberries along with the cloves, ginger and cinnamon sticks to a non-stick pot. Bring to a boil. Reduce heat to medium and allow this mixture to simmer for about 20-30 minutes or until it’s been reduced by half. Strain. Add the honey and mix well. Allow to cool slightly. Bottle, label and keep in the refrigerator. Dose: For children, 2 tablespoons 3- 4 times a day. For adults, 4 tablespoons 3- 4 times a day. You want to administer this at the onset of cold or flu.